Why stone in wet areas should not be sealed. I receive several calls a week with questions about the use of impregnating-type sealers for use on outdoor stone as well as interior stone, such as showers, water fountains, and other wet areas. The questions are all basically the same: Should I seal my stone in wet conditions? Let me explain why stone in wet areas should not be sealed. Impregnators or penetrating sealers: Impregnators are designed to penetrate below the surface of the stone and deposit solid particles in the pores of the stone or to coat the individual minerals below the surface of the stone. These sealers restrict water, oil, and dirt from entering the stone. Impregnators can be solvent or water based. Most impregnators are vapor permeable. Vapor permeable: Vapor permeability describes a stones breathability, or the ability to allow water vapor to pass through it. Most of the impregnators on the market today are breathable. This simple means that the stone will be protected from water entering the pores of the stone in liquid form but will allow water vapor to pass. Sometimes, stone is exposed to unregulated humidity and temperature fluctuations, and the result is condensation. Impregnators are breathable. Therefore, vapor can easily penetrate into the stone. One would think that this is positive, but once the vapor enters the stone it can condense and become a liquid. Since impregnators protect against water in its liquid phase, the moisture becomes trapped within the stones pores and will not escape until it turns into vapor and evaporates. Trapped moisture can result in all kinds of problems. For example, stones with iron content can oxidize. If there are natural salts within the stone, the salt can dissolve and cause pitting and spalling in the surface of the stone. Aesthetically, the stone will appear darker since it is constantly wet. There are currently several people in the natural stone industry doing experiments to demonstrate that sealer in wet environments can cause these issues and to discover in what circumstances, if any, sealers in wet environments may be appropriate. 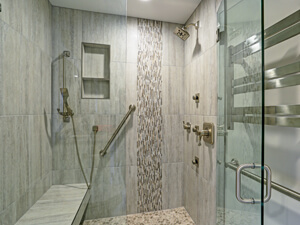 For example, sealed shower walls may be fine, while sealing the shower floor may pose problems. Although their findings are not yet published, I strongly believe that care should be taken when sealing stone in wet environments.